Code Dials - The inner dial turned, and had the Latin alphabet (A-Z) around the edge. The outer dial had a scrambled code alphabet (including secret message, "WEARPFS", see image below). You encoded (or, more properly, enciphered) messages to your friends by translating the letters in your message using the inner ring to the ones on the outer ring, based on an agreed-upon ring position. Magnifying Lens - The inner dial lifted out, and had a magnifying lens that could be used to magnify and study small objects, fingerprint detail, etc. 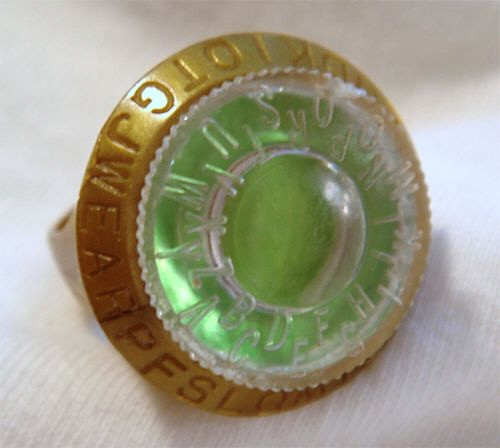 Signal Flasher - Inside the ring, below the magnifying lens, was a piece of foil silver on one side and green on the other. When the silver side was facing up, it reflected light with a "bright" flash that is visible at some distance. The green side was used when coding, because it showed the letters more clearly. Secret Compartment - This was the space beneath the signal flasher foil. When the foil and lens are in position it hid anything in the secret compartment. 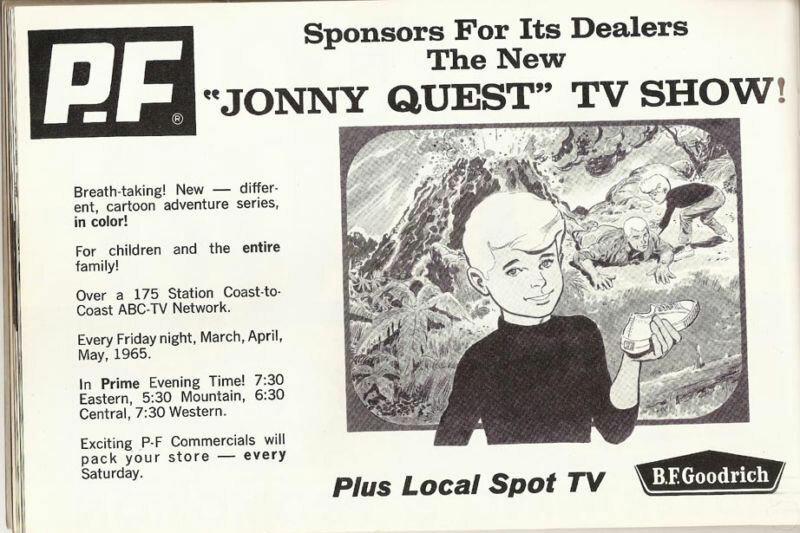 This commercial aired at the end of Jonny Quest episodes on their first runs on ABC in 1964-65. It stars Jonny, Race, Bandit and, of course, P.F. 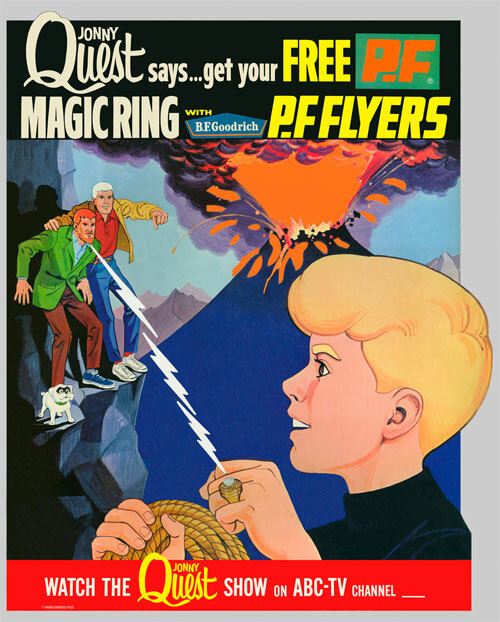 Flyers and the Magic Ring. The P.F. Flyers "Magic Ring"
These pictures show the ring with the flasher disk turned to the green side so you can see the letters on the clear decoding wheel. 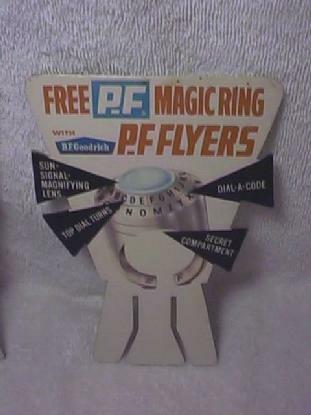 In the second picture, we've outlined the phrase, "WEARPFS" sequence of letters on the outer dial, which was an extra bit of advertising added to this nifty premium. Below those two photos are a set showing the ring from various angles. Each ring came with an instruction card telling the wearer how to use the various features. In fact, the ring was mounted into a slit cut into the top center of the card. Thanks to Jordan Christianson for an earlier, black and white image of the card. Here's are a pair of store banners (4 in. by 20 in.) from P.F. 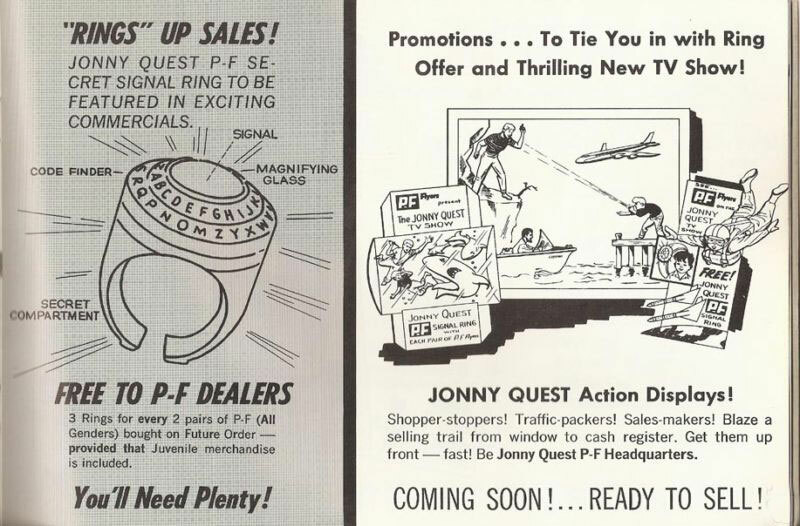 Flyers for the Jonny Quest decoder ring. Thanks to Jim Alexander for these great pics. This counter-top standee featured lights behind the lava in the volcano. The animation shows the lighted and unlighted versions of the display -- the lights didn't blink on the original sign. From Jim Alexander, who contributed the large picture of the standee: "It's got 20 (!) die-cut sections. The 'P.F' in 'P.F. Flyers,' the jagged beam from the ring to Dr. Quest, and the 'exploding mountain' were all meant to be illuminated from behind. The paper behind the die-cut 'bolt' is white, while the paper behind the die-cut 'exploding mountain' is day-glo orange--which gives it a nice effect. Oh--and the 'P' and the 'period' (bullet?) and the 'F' in the upper right-hand corner are die-cut, too--and the day-glo orange paper is behind those sections, as well. It's got fold-out cardboard sections behind it that allow it to stand up and enclose a light source. The top section has circular holes, in order to vent the light source's heat." The sheet above has instructions on how to set up the lighting effect. 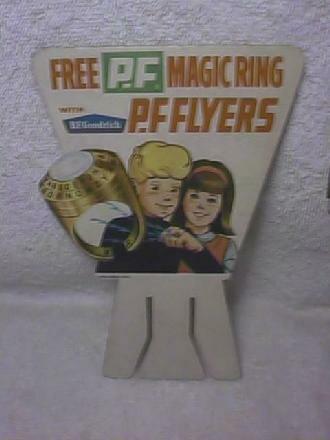 Here's another countertop standee that you might have seen in stores that sold P.F. Flyers. It's got an easel back and, although it's hard to tell from the small photo, the ring is a separate piece of cardstock attached to slots in the cardboard poster to create a 3-D effect. The sign is 17-1/2 inches tall and 13-1/2 inches wide. 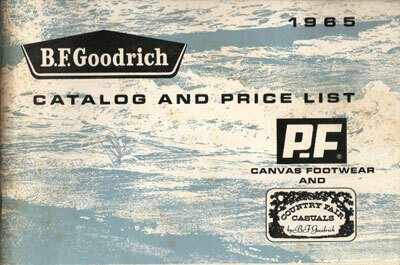 Check out the B.F. Goodrich Product Catalog section below to see drawings of two more in-store displays. 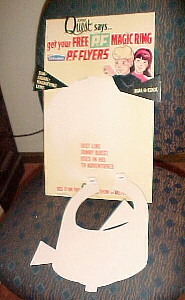 Here's another approach used to advertise the promotion -- a set of shoebox inserts! They were made of cardboard. 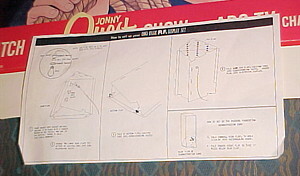 One insert has a picture of Jonny and a girl companion; he is wearing the ring, and there is a picture of the ring next to him. That one is signed Hanna-Barbera Prod. 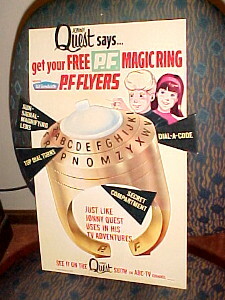 The other insert has an image of the ring on it, with callouts describing the ring's features. Both inserts are the same size, 6 3/4 inches long by 4 1/2 inches wide. P.F. 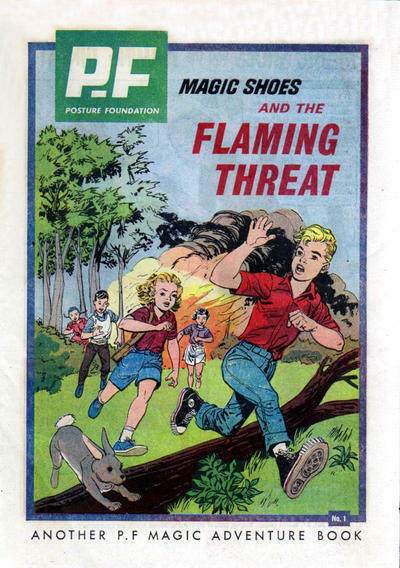 Flyers were part of a line of footwear released by the B.F. Goodrich company -- you probably think of tires when you hear the Goodrich name, but it produced other good made with rubber, including sneakers. 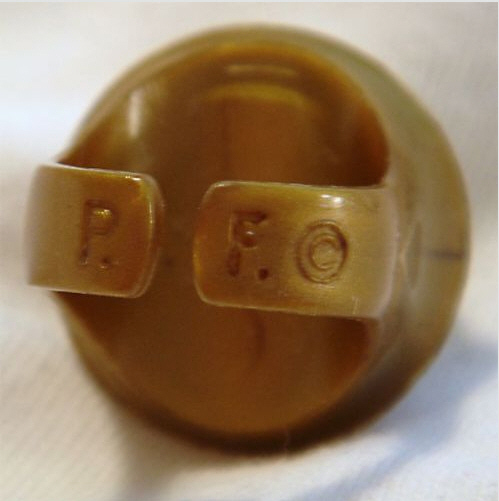 For more information, read the official story of P.F. Flyers. The company put a lot of effort into their Jonny Quest promotion. Here are the JQ pages from the company's 1965 catalog for their footwear lines. And, finally, here are some comments we've received from Jeff Moore concerning the ring.